Boulder has a number of classics. Your favorite central asian leaf steeped in hot water at the Dushanbe Teahouse. Fresh corn and Sister's Pantry Dumplings at the Farmer's Market. 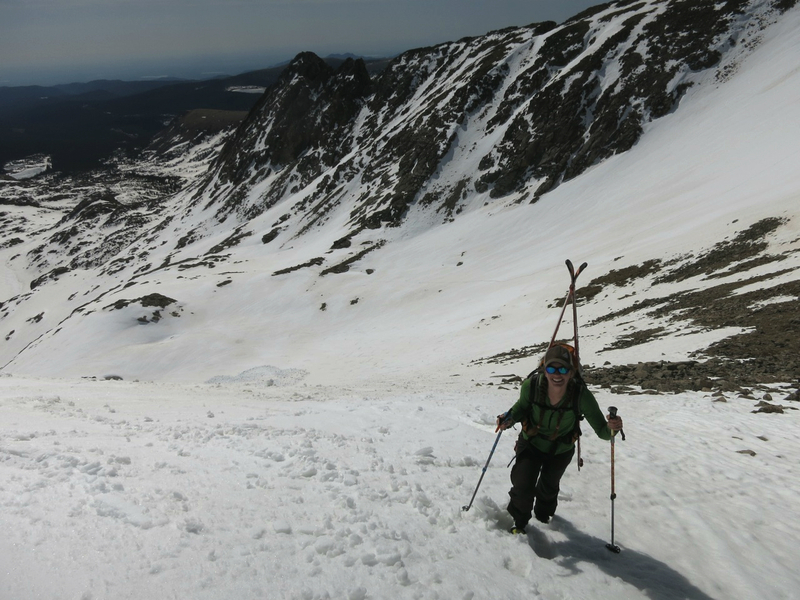 And of course, silky corn turns down the southeast face of Mount Toll. Mount Toll is popular, and for good reason. It's a stellar ski. Truth is, Elaine and I tend to avoid the popular areas, and while this often leads to gems, it's a mistake to skip something so profoundly good for the sake of being different. Toll doesn't come much better than it did this Tuesday. As always, the morning wake-up call is rough, and this time it was me dragging. Once Elaine was up though at the 5:15 alarm, I followed suit quickly. I had the sense to brew a mug of tea before the adventure, which made the drive from our home to the trailhead much more pleasant. Elaine finally saw the beaver that's been building up a storm, getting after it like us in the early dawn. Whenever possible we take Stella on these adventures. I'd say her limit is about 45° slope. She can handle slopes up to that just fine, and possibly even more, but beyond that steepness Elaine and I need to completely focus on ourselves and the mountains, and it's not a risk worth taking. We also draw the line of any slope where rock fall is possible. Again, too much risk. Toll falls well within the safer range and as such Stella was our always good spirited companion. The three of us decided to briskly walk the now completely dry road, foregoing the complexity of bikes and enjoying the mellow 50 minute warm-up. Toll can be a slog, but on this day it was perfect. The lower woods by the creek, the rise to the taiga, heck all the way up to Blue Lake went as smooth as can be, thanks to a copious frozen surface that allowed us to hike briskly up to Blue Lake in running shoes. 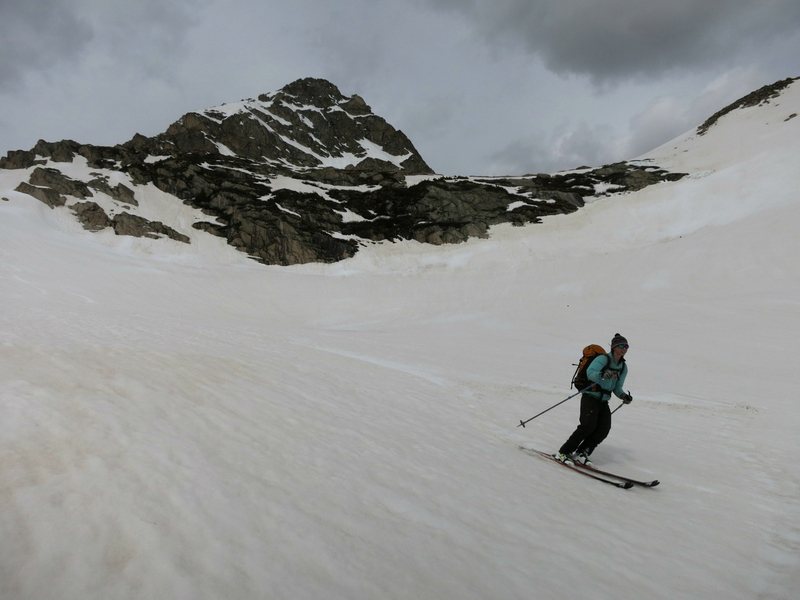 With the lightweight skis and gear, you can really make some time. Gone are the days of having to lug 20 pounds plus of gear into the mountains. Light and fast is the way to go. 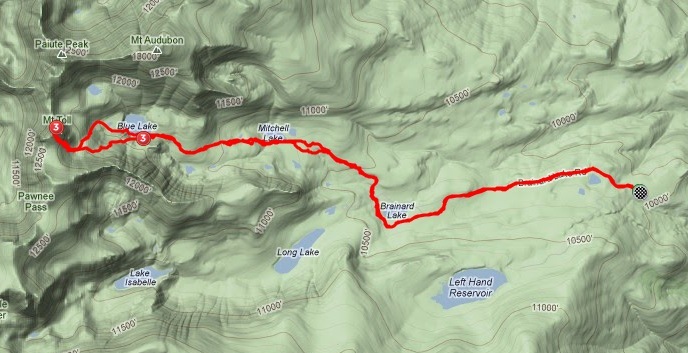 We made our way up from the lake to the lower bench, where we elected to put on skis, boots and ski crampons. The surface was somewhat firm so the crampons add just a bit more security. 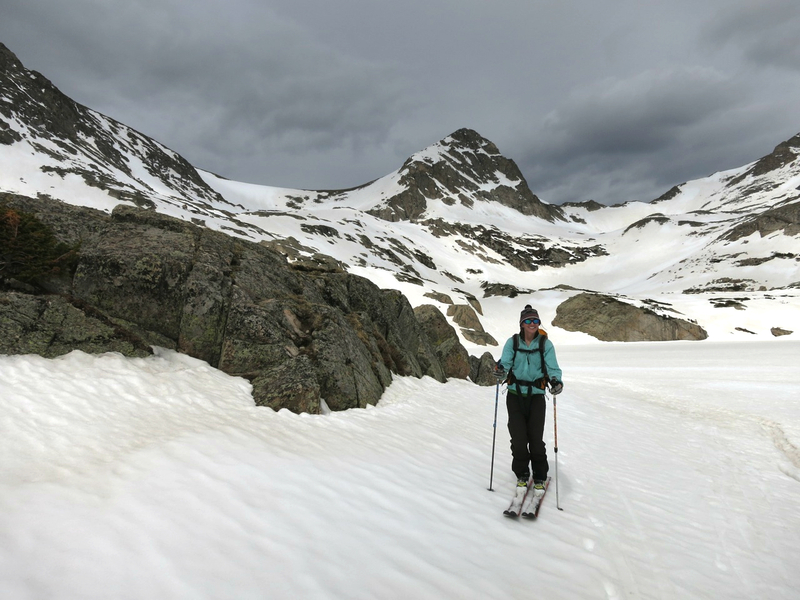 Truth is, with ski crampons, skins and a whippet - an ice-axe like attachment that extends from a ski pole – a person can cover tons of ground, limited only by the steepest and slickest slopes where ice axes, crampons and occasionally ropes are necessary. 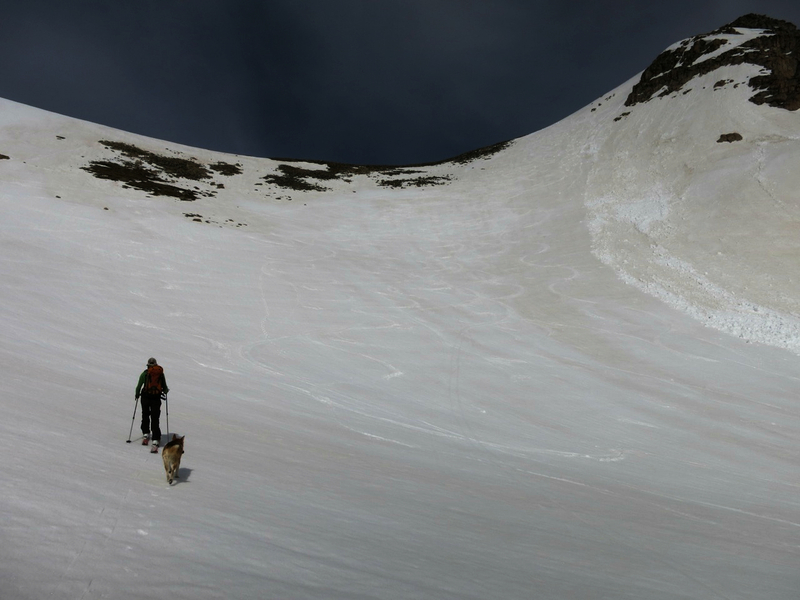 The slopes up to the final Matterhorn-like pyramid of Toll angle in a tricky maze of snow patches, where they finally emerge below the peak proper. This is when the natural stair master starts. We skinned as high as we could, switchbacking constantly to keep the pace moving, before tossing the skis on our back and boot packing up the steep slopes of Toll. I love bootpacking. It's super meditative, a hell of a work-out and just good for the soul. We took turns leading, sometimes following existing steps and sometimes making our own. Elaine has shorter legs than I do, so I have to pay attention to kicking reasonable steps. It's good teamwork. I feel safest skiing with her. 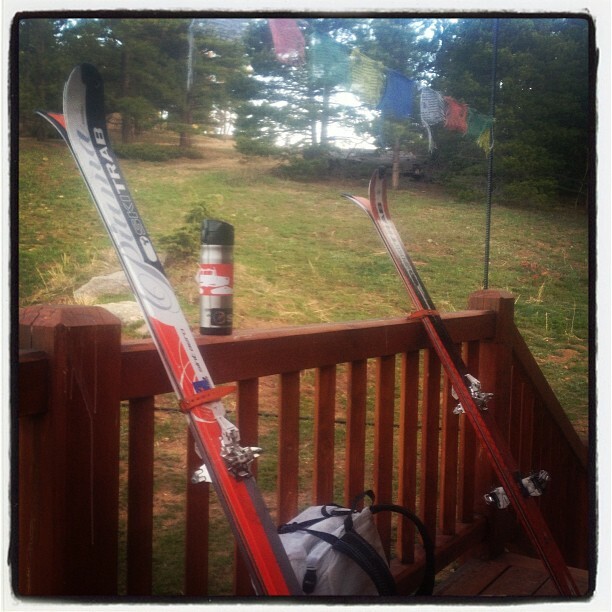 As she says, "we may not always talk every second on these skis, but we're always communicating." It's as subtle as a change in stride, a look, anything. I've come to recognize the key signs she gives me in the mountains and she has the same ability with me. 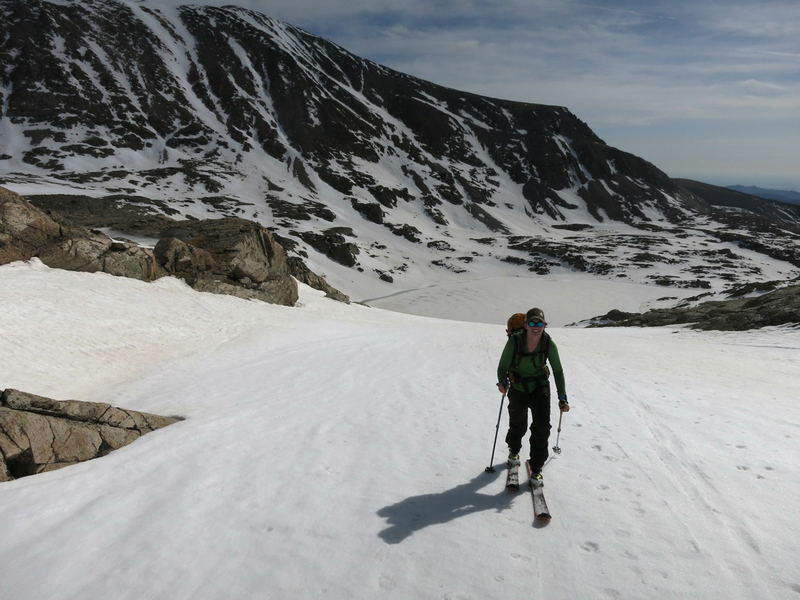 It keeps us safer – well, that and a reverent respect for the mountains. John Muir used to believe the mountains would protect him…as such he'd often just venture out with a loaf of bread and water. I feel a similar thing at times, but it comes with a catch. They must be respected, ego tossed aside, beauty appreciated, danger held in high regard. They are the temples of our time. Soon we were at the top. The entire glacial carved heart of the Indian Peaks stretched out to the north and south of us. Audubon, Paiute, Pawnee, North Arapahoe, Navajo, the glaciers to the west. 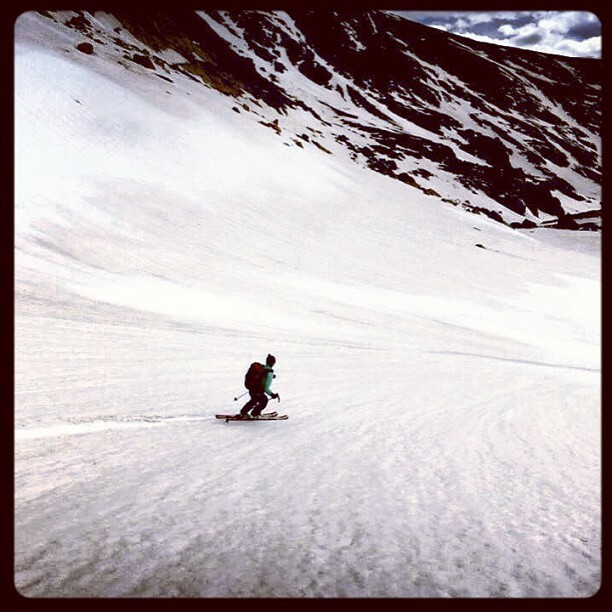 We hope to ski as much of it as possible this spring. In these peaks lie potential hopes and adventure. 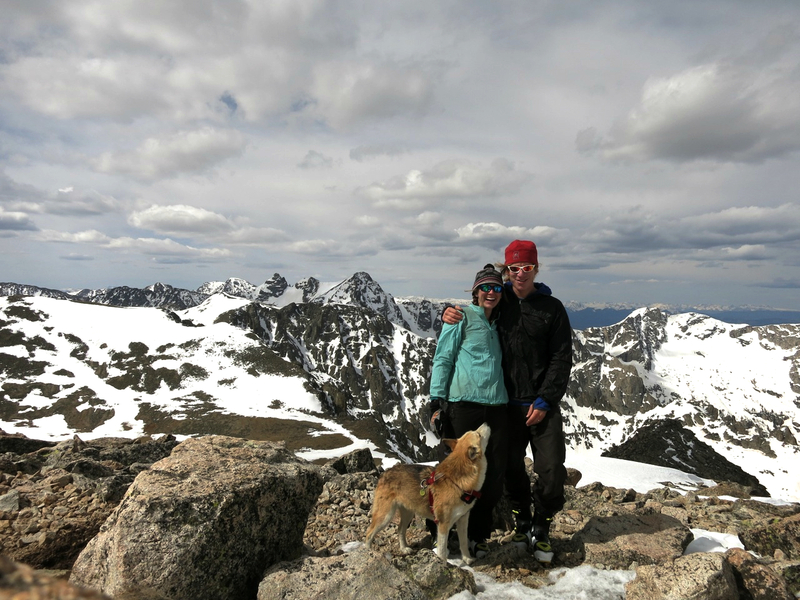 The Indian Peaks are not the mightiest range in the world, or even Colorado, but they suit our needs fine. They are lofty, rugged and spectacular. 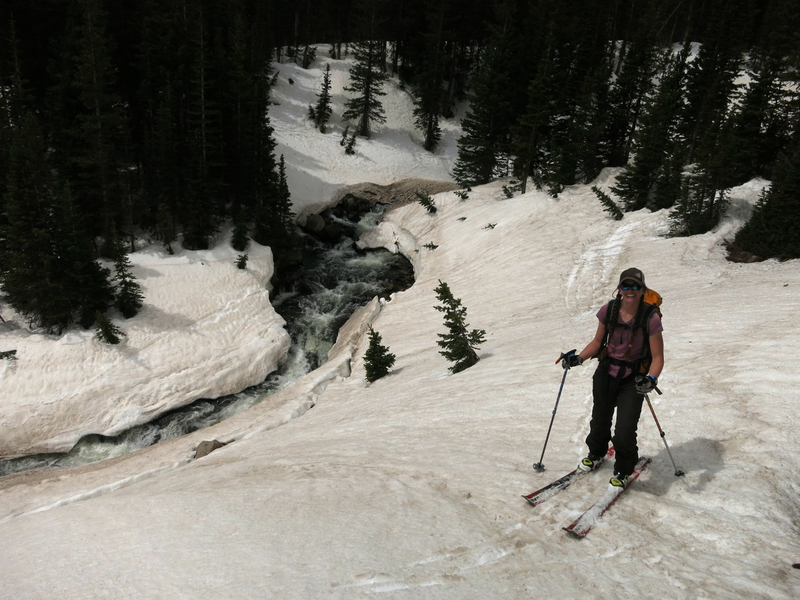 Unlike the Elks or San Juans, they have real deal glaciers, thanks to wind and latitude. They are a great place to live, a home base to hone skills and then visit the great ranges of the planet. Sequitur time: Speaking of great ranges of the planet, I've been proud to see a couple kids (now adults) I used to coach have the opportunity and conviction to visit Nepal and explore the Himalayas. It appears from a far that their experiences were quite different, and one of them was tragic. But I'll leave it to him to explain that story when the time is right. Regardless their stories and photos of that land are spectacular and inspirational…it is an area and mountain range Elaine and I must visit someday. 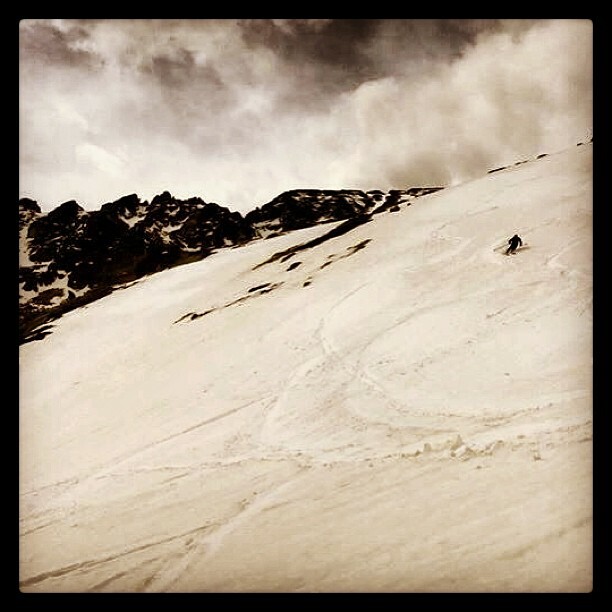 It was time to continue our ski, and enjoy the fun part, the down part. Conditions were a little firm up top, but the Ski Trabs, born in the alpine valley of Bormio, Italy, locked up great. I got these skis back in April 2008, during one of the harder times of my life, and they have been a very trusty companion right from the get go. 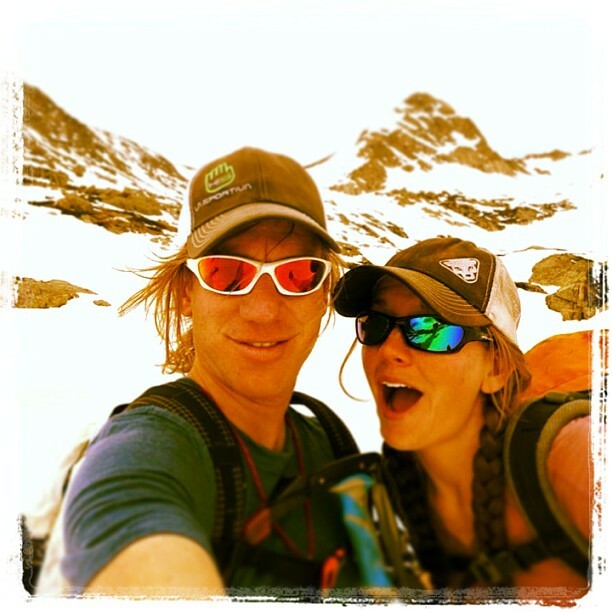 We've climbed lots of mountains together and had lots of adventures and had lots of beauty overcome any darkness. I suppose I'll need to replace them eventually, but they are sentimental to me. That, and when conditions are right – steep, firm and dramatic – they work beautifully. As the pitch increased the snow softened to perfect corn. It's something to savor in this year where things have been slow to set-up. Elaine was up next, arcing turns right down the face, mellow and smooth at first, confident and fast by the end. 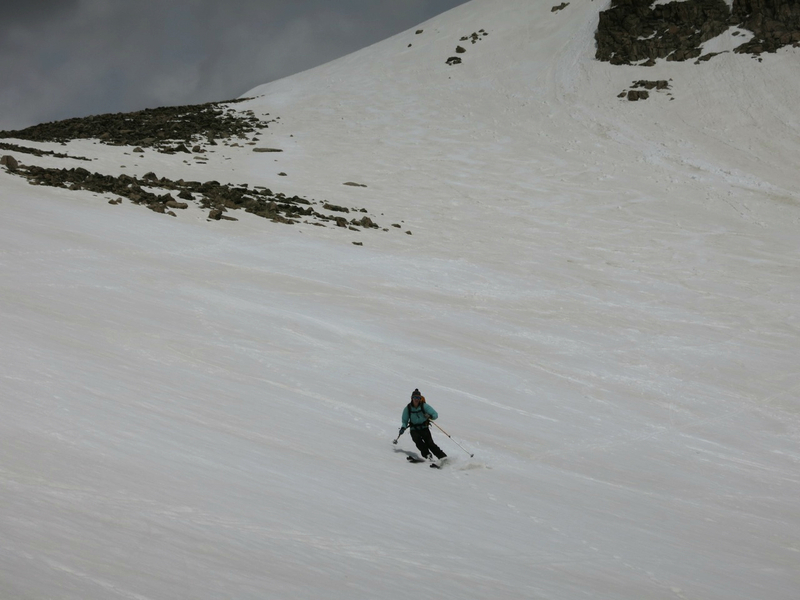 Skiing off the top of a peak is a good feeling, and we were beaming. 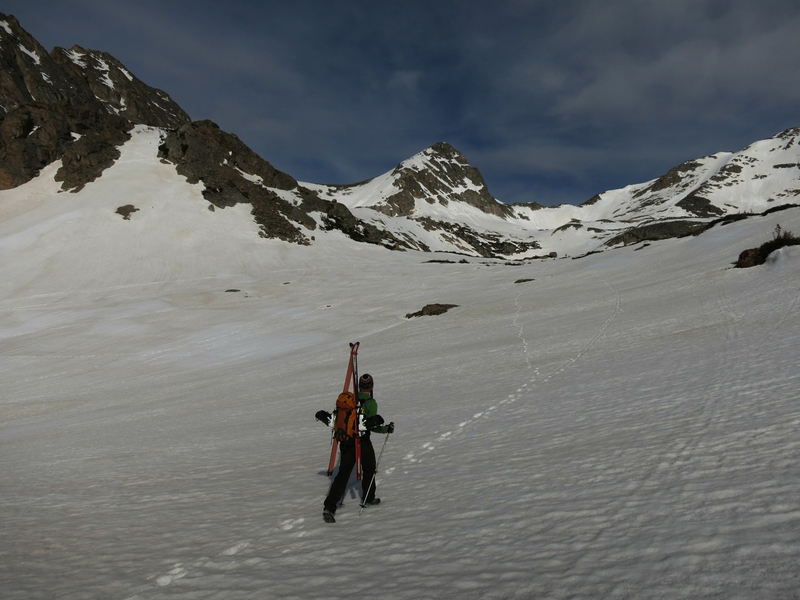 We worked our way down a series of glacial cirques back to the lake. 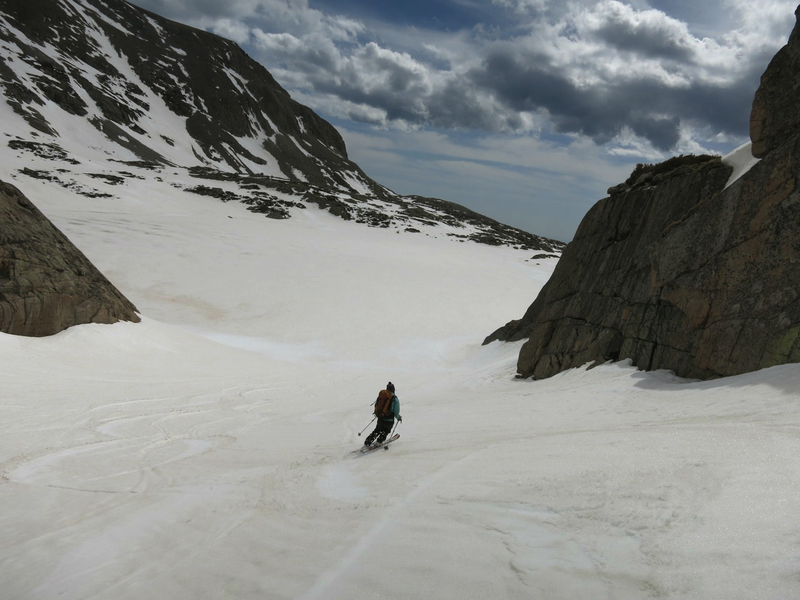 The glide down, rimmed by granite cliffs and spires, feels more like Greenland than Colorado. It was in this area where Elaine and I took one of our first backpacking trip as newlyweds back in 2010, and I smiled with the memory of that. It was not calm on that night – our MegaMid almost blew away and we barely slept a wink as a result, but it's a wonderful recall. It's been a fun life building one together with her. Mountains, skiing and adventure are great, but the addition of love to the concoction makes every day out there feel like winning a championship. Back to the lake and it was a combination of gliding and skate skiing our way to the road. The pine smells and raging creek sounds of spring were our serenade down, the essence of the mountains this time of year. We walked the road back the car, worn but spirited, and realizing the popularity can go hand-in-hand with goodness.